Constructed during the 16th century by the Viscount of Puységur, the castled hosted Gabrielle d'Estrées and Madame de Sévigné. In 1930, the municipality owns the castle and the park. 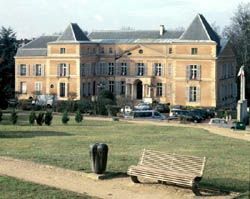 It is today the city hall of the city of Clich-Sous-Bois and has been classified as Historic Monument in 1972. Viscount of Puységur built the castle at the beginning of Henry IV's reign. the tradition requires the Royal Mistress, Gabrielle d'Estréées (1573 - 1599), to dwell there to meet the king. "Bon Roi Henri" ("Good King Henri") is omnipresent in the Seine-Saint-Denis department. After renuncing to Protestantism, he converts to Catholicism and attend the Mass in the Saint-Denis abbey. He also hunts in the forest of Bondy, near the castle. Alexandre Theodore Brongniart (1739 - 1813) is designated to undertake the reorganization of the park. The French architect gets his inspiration from English garden à la mode in France at the end of the 18th century. He bases his works on variety and profusion of the nature. The new garden takes shape thanks to rockery and fake ruins circling a pond. It makes several island emerging and erects a temple of love, like in a theater scene. During the following century, le Bas de Gourmont, general farmer and mayor of Clichy from 1791 to 1794 built and orangery. In 1807, Barmont, a banker, makes several changes including the facade by adding a pediment, a portico and balconies in a neoclassical style.